In a recent personal injury case before a California appeals court, the facts as explained by the court were as follows. The plaintiff sued the city and a driver after she was hit walking across a street in Salinas, California, causing her to suffer severe injuries. The plaintiff was in the crosswalk when she was hit. The crosswalk was painted in 1997 and never repainted. By 2013, when the accident occurred, the crosswalk had faded to the point that it was almost invisible. The crosswalk was located next to private property with a shopping plaza, on which there was a driveway, bushes, pink cement leading to the crosswalk, and a stop sign. The plaintiff claimed that the city was at fault due to the dangerous condition of the city’s property. Evidently, A Salinas city ordinance stated that the city must maintain crosswalks at intersections with the appropriate markings. At trial, the plaintiff requested that the judge give jury instructions on negligence per se based on the city ordinance. The judge refused to give the instruction, and instead gave a jury instruction requested by the city. The instruction stated in part that to find that the driveway presented a dangerous condition, the jury could not rely on characteristics of the driveway itself, and could not rely on the design elements of the intersection to find a dangerous condition existed. The jury ultimately found the truck driver was liable, but found the city was not liable, and the plaintiff appealed. The appeals court held that the jury instruction should not have been given. The court explained that although the instruction correctly stated that the plaintiff was not claiming the city had defectively designed the intersection, it also provided incorrect information. 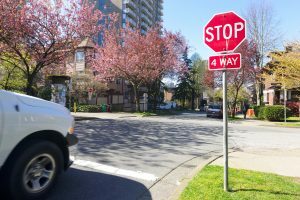 The instruction incorrectly stated that the stop sign and pink cement should not be considered in deciding whether a dangerous condition exists. In fact, the city’s property could be considered dangerous if a condition on adjacent property, like the concrete or stop sign, created a substantial risk of injury on public property. Moreover, the court held that the error in giving the instruction was prejudicial. The evidence showed that the jury drew on the instruction in a way that suggested that it directly associated the instruction with the jury verdict form, and thus, it was reasonable to infer that it was influenced by the incorrect instruction. The jury also submitted multiple questions to the court about the meaning of “dangerous condition,” suggesting that it was having a hard time with the issue. Based on this evidence, the court determined that the incorrect jury instruction was prejudicial and that the jury’s decision had to be reversed. Having an effective advocate on your side is essential. The Neumann Law Group has over 200 years of combined experience representing accident victims. We are dedicated to helping victims navigate the legal system to aid them in obtaining financial compensation and to hold people accountable for their actions. We handle motor vehicle claims and a wide range of California personal injury claims. We provide trustworthy, experienced legal representation to personal injury victims in the Los Angeles and Orange County areas. Call us at 1-800-525-NEUMANN or contact us online to set up a free consultation. California Court Finds College May Be Liable for Injuries Sustained by Visiting Athlete, California Injury Lawyer Blog, December 10, 2018. Cell Phone Use Is a Primary Cause of California Distracted Driving Accidents, California Injury Lawyer Blog, January 14, 2019.